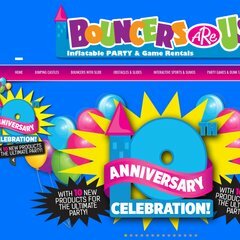 Topics: Inflatables, Obstacles & Games, Sumo Suit, Dunk Tank, & Website Design. Gigenet (Illinois, Chicago) is the location of the Apache/2 server. Its local IP address is 69.65.38.192. ns2.webstarmultimedia.com, & ns1.webstarmultimedia.com are its DNS Nameservers. PING (69.65.38.192) 56(84) bytes of data. A time of 44.0 ms, is recorded in a ping test.